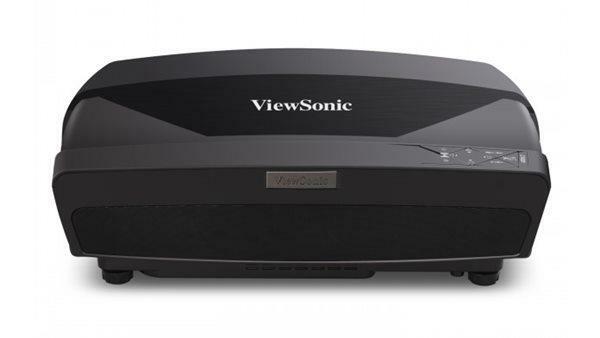 Almost everyone is familiar with the concept of Home Theater In a Box, or HTIB. Usually, these systems include a combination DVD player/AV receiver, a 5.1 speaker system, some cables, and a remote control. These systems can range in quality, and indeed many are overpriced and underperforming, but the idea is always the same - give consumers a way to enjoy surround sound without making them research the individual components first. What these systems don't do is provide a complete home theater experience. The whole concept of home theater, by definition, is to create an environment that looks and feels like a theater, only at home. A flatscreen television and some speakers do not truly recreate that big-screen experience. What Epson has done with the Ensemble HD system is create the first true Home Theater in a box. The Ensemble system uses a high definition projector and a 100" 16:9 screen to bring a true theater experience into the home, in a way that is easy and accessible to the average consumer. You can now have a reasonably-priced 1080p projection system installed in your home in as little as four hours. If you have always wanted the big-screen experience but found the planning, component selection, and installation daunting, the Ensemble is made for you. There are three versions of the Ensemble system, at three different price points, but the only difference among them is the projector itself. The least expensive system, at $4699, includes the Epson Powerlite Home Cinema 720, which is one of the best 720p projectors on the market. The other two systems include the Powerlite Home Cinema 6100 and Powerlite Home Cinema 6500UB, which are both 1080p projectors. These systems sell for $5999 and $6899, respectively. All of the remaining components of the system are the same. They all use the same 100" motorized 16:9 screen, the same speakers and subwoofer, and the same A/V controller. Since we have already reviewed all three of these projectors, this review will concentrate on the system as a whole, rather than the projectors. Projector - Epson Powerlite Home Cinema 720, 6100, or 6500UB. All of these projectors have 2.0:1 zoom lenses, extensive vertical and horizontal lens shift, and quiet operation. All are fairly bright, so some room lighting during a football game or similar content is not a deal-breaker. Two of the three projectors appear on our Highly Rated list; the sole exception is the Home Cinema 6100, which is still an excellent projector in its own right (it missed making the list by half a point). 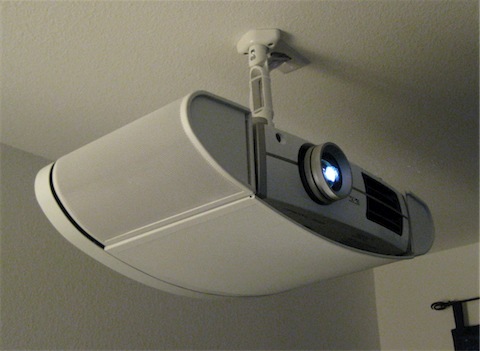 Projector cradle - The cradle incorporates the projector's ceiling mount, which can be mounted flush with the ceiling or lowered using a drop tube. The cradle also holds the surround speakers. Combining components like this helps the Ensemble system simplify the installation process. Speakers - Made by Atlantic Technologies, the system incorporates the Left/Center/Right speakers on the screen itself, surrounds on the projector cradle, and a powered 10" subwoofer which also serves as amplifier for the whole system. We at Projector Central are not audio experts, so our evaluation of the speaker system is somewhat cursory - but the Ensemble system is loud enough to shake the room, which has an attraction all its own. Screen - The 100" diagonal 16:9 screen is motorized, with extra black border space at the top so you can adjust placement on the wall. The screen is made of 1.0 gain white material, which is ideal for the viewing of film in darkened environments. A/V Controller - The system's heart. This incorporates the DVD player (upscaling, progressive-scan), A/V Receiver (where you can plug in other components), auxiliary input, USB port, and radio tuner. 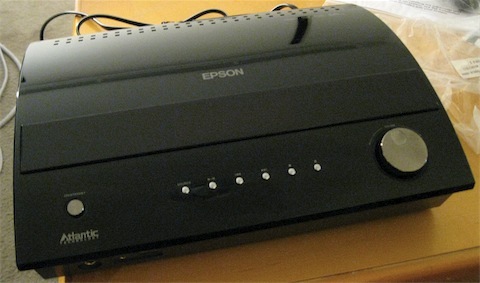 Epson has incorporated an infrared extender leading to a sensor on the screen, so the controller can be safely tucked away in a closet without losing the ability to control everything from your seat. Cables and hardware - The system includes all the connections you'll need to make between the components, as well as some spare video cables. The system also includes several different sets of screen-mounting and projector-mounting hardware, to account for differences between rooms. As we experienced during our own installation, these can come in handy. Universal remote - The system's remote is made by the Universal Remote Control company, which can get a little confusing since every manufacturer calls their device a universal remote. This model is the MX-350, which uses both infrared (IR) and radio frequency (RF) emitters to get the signal to your system's components. It has a small LCD screen near the top, which you can program with different options depending on your needs. It comes preprogrammed with all of the Ensemble system's components, as well as a macro for turning everything on or off at once. Equipment cabinet - the system includes an enclosure that is built to hold the A/V controller and powered sub, and has a spare shelf for any other components you would like to add, such as a Blu-Ray player. These parts, taken as a whole, are the Ensemble system.